The Anton-Neumayr Platz is a square in the Altstadt or Old Town of Salzburg. It can be found between the Republic (the former Stadtkino) and the Gstättengasse. It is well-known as a picturesque piazza with some interesting antiques shops, inns a nice fountain at its centre and the Mönchsbergaufzug (a lift to the Museum of Modern Art). Whilst the square is ancient and the surrounding houses are mostly Medieval (or Baroque at latest), the name is rather new: Anton Neumayr lived from 1887 to 1954, was mayor of Salzburg from 1946 to 1951 and for more than two years vice-governor of Salzburg province. The square was named Anton-Neumayr Platz in the year he died in, 1954. Noteworthy details about the Anton-Neumayr Platz (ignoring the inns and their lovely outdoor tables during the summer - all three weeks) include the Marienbrunnen, a fountain dedicated to the Virgin Mary. It was built in 1691 under the rule of Prince Archbishop Johann Ernst Graf von Thun und Hohenstein. Behind the Stadtkino, you will find the Haus der Natur, Salzburg′s museum of natural history. Today it extends to a building that was once home to the Salzburger Museum Carolino Augusteum, the predecessor of the current Salzburg Museum. Behind the Haus der Natur, you can see the former Urusulinenkloster, a nunnery, and the Baroque Markuskirche by Johann Bernhard Fischer von Erlach. Following Gstättengasse to the Gstättentor, a Medieval gate of the city walls, you will pass a section where the Almkanal runs through; right next to it there is a building that (falsely) claims to be the oldest bakery of Salzburg. Speaking of historic facts: The Anton-Neumayr Platz was home to the original Stiegl brewery. Stiegl is the biggest brewery of Salzburg and was founded here in 1492. 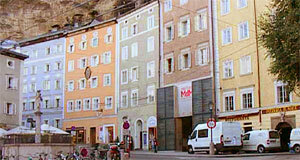 The "mother" of the brewery was sold in 1909; today, the brewery can be found in Maxglan, its biggest inn just underneath the Fortress Hohensalzburg. Eventually, the Ursulinen nuns purchased the original brewery, which was in bad shape, and had the building demolished. They first built a school at the site, which moved to Aigen in the 1970ies. Since then, the building is used by administrative bodies and private companies.